There are so many emoji choices out there - including families with with two female parents, two male parents and single parents. Would it be so hard to add a few black families? Or families with non-white skin tones? Above: You can choose skin tones for other emojis, but not families. The first factor to note is that there aren't white family emojis either. At least not on iOS or Android. 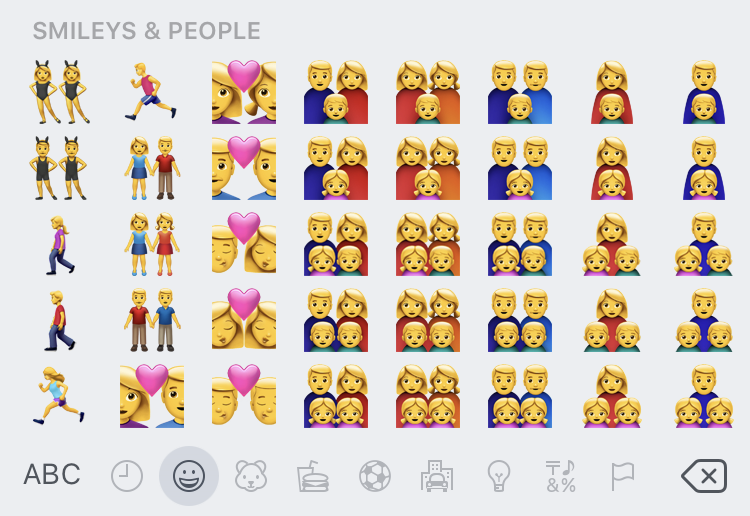 When looking at most emoji keyboard, what you're seeing is a collection of yellow families, which is emoji-speak for the representation of a neutral or "non-human" skin tone. Above: Yellow family emojis are intended to be neutral: not black or white. The issue stems back to skin tone implementations in the first place. People want to be represented on their emoji keyboard - but no matter which options are available, there's always a default. It probably didn't help that a certain cartoon family makes the case that yellow isn't really neutral. In the world of the Simpsons, yellow means white. 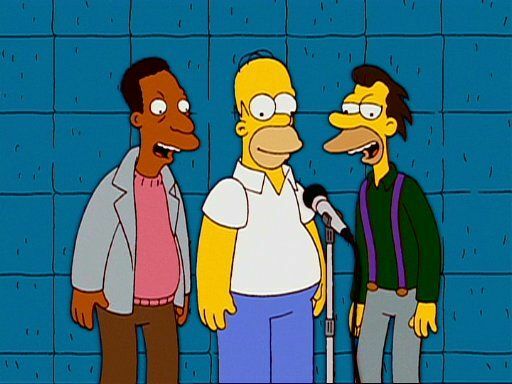 Above: The Simpsons uses yellow as a stand-in for white skin. Putting aside the issue of defaults for a moment; other emojis all have a choice of skin tones. Why not the families? The answer is that black family emojis are already possible. Unicode supports the sequences required to make emoji families with any combination of people or skin tones. In 2016, Microsoft used these ZWJ sequences to create white families, black families, and all kinds of variations in between in an update to Windows 10. Above: Diverse families available in Windows 10. At the time of writing, these diverse family emojis aren't available on any platform other than Windows. Assuming that a company like Apple or Google wanted to add support for skin tones for families, it's fair to say that they wouldn't want to limit this to just one or two of the skin tones available. In total, Unicode supports a default skin tone, and five variations. At a minimum, each of these would need to be supported. It might then be an odd step to require that every family consist of only people who share the same skin tone. Above: Adding skin tone support to family emojis requires a large number of combinations. Image: Emojipedia Mockup / Apple Composite. 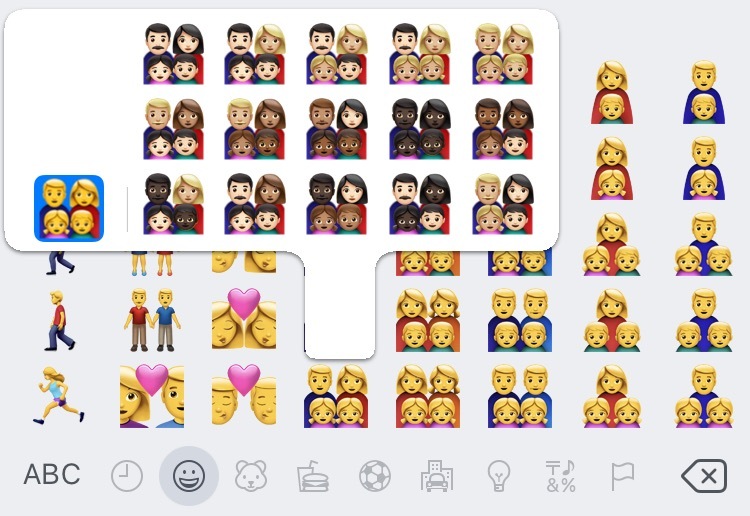 As Microsoft discovered when adding skin tone support to emoji families in 2016, providing the combinations required so each family member can have any skin tone equals a lot of new emojis. The tally for Windows was 52,000 new emojis when each family combination was taken into account. Try fitting that on your emoji keyboard! Above: Family emoji combinations supported on Windows 10. So what are the answers then? Firstly, kudos to Microsoft for attempting this. Their vector font technology allows layering of various images like this, which does allow them to be more nimble than fonts that use bitmap images. Is the answer for vendors to support a subset of possible family emojis? If so, which ones should be supported would be the next logical question. And if vendors do want to show these possibilities on their emoji keyboards, what would be an appropriate user interface to do this? Above: User interface is one issue for vendors to look at when diversifying family selection. Image: Emojipedia Mockup / Apple Composite. Should vendors have a settings panel to choose your preferred few family emojis? Or a picker-UI to choose each family member individually? Or should they stay yellow-only? Tweet us with your ideas of how diverse family emojis could or should work. Last year, Samsung released an impressive emoji update which featured one puzzling addition: Emojipedian @DHowett noticed something odd about this new emoji from Samsung. Can you spot it? https://t.co/47QKPgfOpG pic.